You guys these coconut caramel tartlets are so good! And super easy to make too! If you have tried my Salted Caramel Chocolate Cups, then you know how yummy a caramel made with dates is. These little tartlets are perfectly proportioned too. Just a little bite of sweetness. This tartlet recipe also makes a very small batch so you don’t have to worry about having too many sweets in your house at once. Very easy recipe as well. The perfect bite of sweetness. In a food processor , combine the crust ingredients. Press the crust into each tartlet shell . It will seem kind of crumbly. but I promise it firms up in the fridge. Once all the tartlets have the crust, stick them in the fridge to firm up. To make the filling, make sure the dates have been soaking in water. Drain the water that the dates were in, and add the dates to a food processor or blender with the vanilla and 2 T of new water. Blend until everything is smooth. You may need to scrape down the sides often. Once the filling is made, spoon it into each tartlet and store them back in the fridge. These tartlets should last 7-10 days in the fridge. Store them in an airtight container. Enjoy! These are very good . These look great! Dough is firming up in the fridge now :) Can I ask how many tartlets you got out of them? I made them in mini muffin cups and got a dozen, but it looks like I might have used too much dough and didn't leave enough room for filling. I only got 5 tartlets in mine. Let me know how they come out in the muffin cups. Good idea! 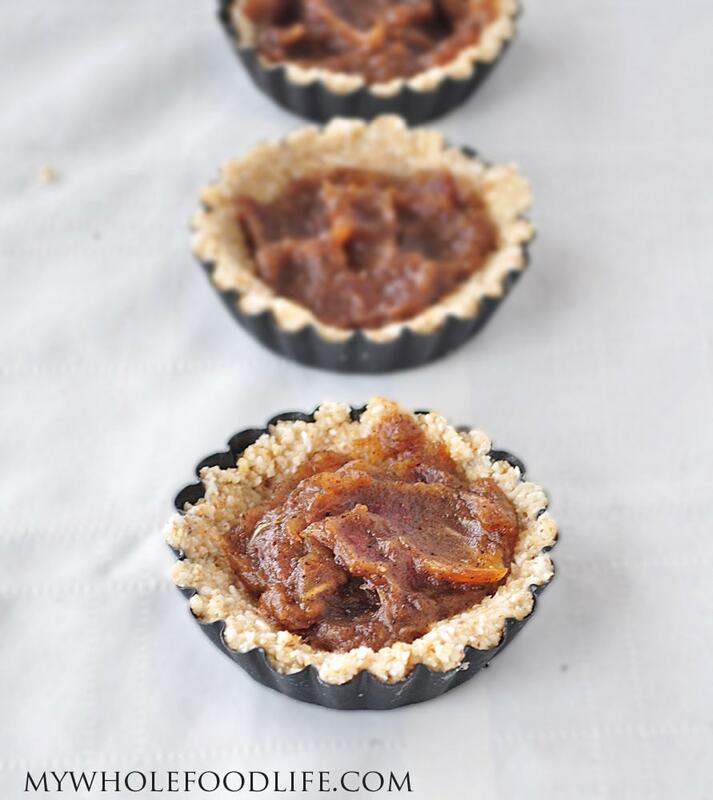 Oh these look so good and so healthier than the butter tarts my husband loves! Oohh! I love how this recipe is easy to make and they sure look delicious. I'm wondering if a blender would work just as well as a food processor. these look yummy and easy! Do you think you could use almonds instead of walnuts? Thank you! Yes I think you could. Hi there. Looks great. What would you use instead of nuts for the crust? Nut allergies. Thanks! Can you still eat the coconut? You can sub rolled oats for the walnuts. I love this type of caramel! And small bites are awesome!!! Would ramekins work? I don't own any of those cute little tartlet shell pans like you uses. :-) Also, what's the width of your shells? Wondering if my ramekins are big enough. They probably would work. Let me know how they turn out that way! How long do you soak the dates for? Pingback: Raw kokos caramel taartjes | Wat eet je dan wel? I just made the tartlets, they look superb. I substituted coco nut creme for the water and used pecans for the crust. Melted a little cacao chips and drizzled over top. Absolutely delicious! So glad you enjoyed them Ladonna!